Bachelor parties are a great way to get all your guys together in one place and act like you're not really grown-ups but somewhere between 15 and 21 years-old. So, obviously, celebrating a bachelor party alone is probably sadder than waking up next to a stripper with your engagement ring gone (that's something that happens, right?). Unfortunately for Robbie Chernow, that's exactly what happened (the celebrating alone part, not the stripper). Chernow flew from New York to Chicago for his friend Jake's bachelor party, only to find out that the flight with everyone else on it had been canceled, and they couldn't rebook in time. But not to worry, Chernow isn't going to let a lack of other humans get in the way! 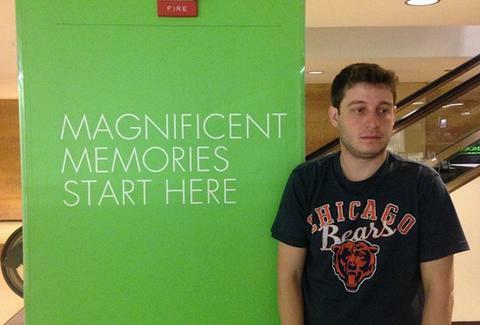 He's been doing all of the planned bachelor party activities by himself and documenting it all on Instagram with the hashtag #ChicagoForOne. Yes, he's done Navy Pier alone, a Bears game alone, and the 360 Degree Experience at the John Hancock Tower alone -- and in the fog, because there's really just no winning here. One of Chernow's friends even started a GoFundMe campaign to give him a little extra cash to spend on himself and his ghost friends. According to his Instagram, he's also been using Tinder -- not for anything sexual, but just to find the best deep dish pizza and fun tourist activities for one. FYI, here's the pizza, Rob. Lucy Meilus is a staff writer for Thrillist and a known bachelor party expert. Follow her on Twitter at @Lucymeilus and send news tips to news@thrillist.com.